History Sumo is an ancient sport dating back some 1500 years. Its origins were religious. The first sumo matches were a form of ritual dedicated to the gods with prayers for a bountiful harvest and were performed together with sacred dancing and dramas within the precincts of the shrines. In the 8th century sumo was introduced into the ceremonies of the Imperial Court (Nara Period). Early Sumo was a rough-and-tumble affair combining elements of boxing and wrestling with few or no holds barred. But under the continued patronage of the Imperial Court rules were formulated and techniques developed so that it came more nearly to resemble the sumo of today. Sumo, quite naturally, was regarded chiefly for its military usefulness and as a means of increasing the efficiency of the fighting men. Later in the hands of the samurai, juijitsu was developed as an offshoot of sumo. Peace was finally restored when the different warring factions were united under the Tokugawa Shogunate in 1603. Professional sumo groups were organized to entertain the rapidly expanding plebian class and sumo came into its own as the national sport of Japan. The present Japan Sumo Association has its origins in these groups first formed in the Edo Period. Rules The sumo ring is called the dohyo and takes its name from the straw rice bag which mark out its different parts. The greater portion of each bale is firmly buried in the earth. The dohyo is 18 feet square and 2 feet high and is constructed of a special kind of clay. The hard surface is covered with a thin layer of sand. The bout is confined to an inner circle a little over 15 feet in diameter. Over the dohyo suspended from the ceiling by cables is a roof resembling a Shinto shrine with four giant tassels hanging from each corner to signify the seasons of the year. A bout is won by forcing the opponent out of the inner circle or throwing him in the dohyo. To lose the match it is not necessary to fall in the circle or to be pushed completely out. The rikishi (sumo wrestler) who touches the ground with any part of his body, his knee or even the tip of his finger or his top-knot, loses the match. Or he need only put one toe or his heel over the straw bales marking the circle. Striking with fists, hair pulling, eye gouging, choking and kicking in the stomach or chest are prohibited. It is also against the rules to sieze the part of the band covering the vital organs. As there are no weight limits as in boxing or western wrestling it is possbile for a rikishi to find himself pitted against an opponent twice his own weight. There are six Grand Tournaments a year, three are held in Tokyo, one in Osaka, Nagoya and Kyushu. A tournament lasts for fifteen days, each rikishi fighting once every day with a different opponent. The winner of the tournament, in other words the rikishi with the best record of wins over losses, is awarded the Emperor's Cup on the final day after the last match. There are three additional prizes, the shukunsho awarded to the rikishi who upset the most yokozuna (grand champions) and ozeki (champions), the kantosho for fighting spirit and the ginosho for technique. To be eligible for any of these prizes, the rikishi must also have won at least eight of his fifteen matches. Hierarchy There are at present about 800 rikishi in professional sumo from the lowly trainee to the yokozuna at the top. After each Grand Tournament the banzuke (ranking) are revised rikishi being either promoted depending on their performance during the fifteen days. A new official banzuke is issued by the Nihon Sumo Kyokai printed in an ancient, stylized calligraphy. The rikishi are first arbitrarily devided into east and west teams although they do not compete as teams nor is a rikish from one team necessarily matched against one of the other. Heading the banzuke in large, bold characters are the names of the upper division rikishi, the maku-uchi. The maku-uchi group includes the five top ranks: Maegashira 15 - 1, Komusubi, Sekiwake, Ozeki and Yokozuna. The number of the maku-uchi are within 40. The remainder ot the upper division rikishi or approximately a quarter of their total number are distributed among the top four grades. Listed below these on the banzuke, in progressively smaller characters, appear the name of the juryo and makushita, and below these the san-dan-me, jo-ni-dan lastly thejo-no-kuchi. The matches start in the morning with those of the lowest ranking rikishi, followed by those of progressively higher and higher rank, building up a climax toward the end of the day with the bouts featuring the yokozuna. The position of the yokozuna in unique. In the past three hundred years since the title was created only sixty-eight rikishi have been so honored (see the list of all Yokozunas). The yokozuna, alone of all the ranks can never be demoted even if he makes a poor showing during a tournament. Instead should he continue with a bad record, he is expected to retire. Before a rikishi can even be considered for promotion to yokozuna he must have won two consecutively tournaments while holding the rank of ozeki. He must have proven himself capable of turning in consistent performances and in the critical eyes of the Sumo Kyokai be a man of character worthy to hold such an exalted position. For a promotion to ozeki he must have won 32 fights within three tournament in succession while holding the rank of sekiwake. For all the other rikishi they will be promoted after a kashi-koshi (8 wins upwards in a tournament) or be relegated after a make-koshi (8 losses upwards in a tournament). As more wins or losses they scores as higher they can rise or fall in the banzuke. Ceremony Sumo has managed to survive with its formalized ritual and traditional etiquette intact making it unique among sports. On each day of the tournament immediately before the maku-uchi matches are scheduled, the colorful dohyo-iri or "entering the ring" ceremony take place. Down one aisle in reverse order of their rank comes one team of maku-uchi rikishi wearing a kesho-mawashi or ceremonial aprons. These aprons, beautifully made of silk, richly embroidered with different designs and hemmed with gold fringe cost anywhere from 400'000 to 500'000 yen (USD 3'300.-- to 4'200). The rikishi climb into the dohyo and go through a short ritual ancient in sumo tradition after which they depart to be followed by the other team entering from the opposite aisle to repeat the ritual. The leading roles in the dohyo-iri (formal ring entering) are reserved for the yokozuna who have not taken any part in the ceremony up to now. A yokozuna comes down the aisle attended by a senior gyoji (referee) and two maku-uchi rikishi in kesho-mawashi one bearing a sword. Over his kesho-mawashi the yokozuna wears a massive braided hemp rope weighing from 25 to 35 pounds tied in a bow at the back and ornamented in the front with strips of paper hanging in zigzag patterns. This is a familiar religious symbol in Japan. After first clapping his hands together to attract the attention of the gods, he extends his arms to the sides and turns palms upward to show he is concealing no weapons. Then at the climax he lifts first one leg to the side high in the air, then the other, bringing each down with a resounding stamp on the ground symbolically driving evil from the dohyo. After he has attendants the other yokozuna enter, in turn, and repeat the ceremony. The concluding rite of the day is the "bow dance." After the final match a specially picked makushita rikishi climbs into the dohyo, is handed a bow by the gyoji with which he performs the yumitori-shiki, a brilliant routine with a twirling bow. The ceremony was introduced sometime during the Edo Period when a winning rikishi was awarded a prize of a bow and to express his satisfaction performed the "bow dance." This may be considered an expression of satisfaction on behalf of the victorious rikishi of the day. The Salary To define the exact income of a Rikishi is difficult because the Rikishi receives an amount of money of his sponsor after a won bout. In the same way the shukunsho, the kantosho and the ginosho are connected with a value. Together with this unregular contributions the Rikishi draw a fixed salary each month, dependent on their ranking. A Yokozuna earns 2'234'000 Yen (USD 19'000.--), an Ozeki earns 1'859'000 Yen (USD 16'000.--), ein Sekiwake or Komusubi earns 1'340'000 Yen (USD 11'400.--), a Maegashira earns 1'036'000 Yen (USD 8'800.--) and a Juryo-Fighter earns 820'000 Yen (USD 7'000.--). The Beginning... For the match the rikishi are naked except for a silken loincloth called the mawashi. Made of heavy silk approximately 10 yards long by 2 feet wide. It is folded in six and then wrapped around the waist from four to seven times depending on the girth of the rikishi. The mawashi is a fundamental part of the rikishi's equipment. It may be said to have determined the whole form of sumo. 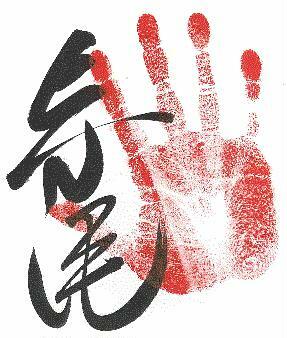 There are seventy winning tricks most of which are achieved by maneuvering the opponent with a grip on the mawashi. The strings hanging from the front are of silk stiffened with glue and as they are purely ornamental can be discarded when they become detached as they frequently do in the course of a match. After entering the dohyo each rikishi goes through a series of symbolic movement. To cleanse his mind and body, he symbolically rinses his mouth with water, the source of purity, and wipes his body with a paper towel. Certain motions are repeated from the yokozuna's dohyo-iri, the raising of the arms to the side as well as the stamping of feet. Each rikishi also scatters a handful of salt to purify the ring. This is further supposed to insure him against injuries. The salt-throwing is, however, the privilege only of maku-uchi, juryo and maku-shita rikishi. The rikishi then squat and face each other in the center of the ring, crouch forward in a "get set" position supporting themselves with their fists on the ground and proceed to glare fiercely at each other. This portion of the ritual is called the shikiri. They do not begin the match at once, however, but engage in a kind of "cold warfare." They go back to their corners for more salt, scatter it and return to glare. They repeat the process again and again, usually for the full four minutes allowed by the rules. In early sumo the start of a match could be delayed indefinitely. A ten minute limit was first introduced in 1928, later reduced to seven, then to five down to the present four minutes. The bout, itself, is usually over in a matter of minutes, in less time than it took for warming up, but for the sumo aficionado those brief moments are packed with thrills. B Banzuke: The official listing of rank in ozumo. D Danpatsu-shiki: A rikishi's retirement ceremony in which his top knot is formally removed. Dohyo: The sumo ring. Made of packed clay, it consists of a square platform with a circle made of dirt-packed straw bales bedded in its surface. The dohyo is between 34 and 60 cm. in height and the diameter of the inner circle is 4.55 m.
Dohyo-iri: The formal ring entering ceremony performed by members of the top two divisions in ozumo. G Gino-sho: The Technique Prize. This prize is given to a rikishi in the top division ranked below ozeki who demonstrates outstanding technique over the course of a given "basho" or tournament. Gyoji: The referees. There are eight ranks in this profession, with promotion based on a combination of seniority and competence. Each gyoji will take one of two "clan" names as his family name; Kimura or Shikimori. J Jonidan: The second division from the bottom on the banzuke or official listing of rank. Jonokuchi: The lowest division on the banzuke or official listing of rank. Juryo: The second highest division on the banzuke or official listing of rank. Juryo is the first division in which rikishi receive all the privileges and honors that come with being a member of ozumo's elite, "sekitori" class. K Kanto-sho: The Fighting Spirit Prize. This prize is given to a rikishi in the top division ranked below ozeki who demonstrates the most fighting spirit over the course of a given "basho" or tournament. Kesho-mawashi: The ceremonial apron worn by rikishi in the top two divisions during their dohyo-iri or ring entering ceremony. Komusubi: The fourth highest position on the banzuke or official listing of rank. M Maegashira: Indicates a rikishi in the top, Makunouchi division competing below that division's elite, top four ranks. Mage: The top knot worn by rikishi. The top knot is shaped into two different hair styles. The first, the chonmage, is worn by all rikishi. The second, the o-icho, is worn by members of the top two divisions when they compete and on other formal occasions. Makushita: The fourth division from the bottom on the banzuke or official listing of rank. Makunouchi: The top division on the banzuke or offical listing of rank. Mawashi: The loincloth like garment worn by rikishi when they train or compete. O O-icho: The more formal hair style worn by rikishi in the top two divisions when they compete and on other formal occasions. Ozeki: The second highest rank in ozumo. R Rikishi: Literally, "a gentleman of strength". This is the term used to indicate a competitor registered with The Nihon Sumo Kyokai. S Sandanme: The third division from the bottom on the banzuke or official listing of rank. Sanyaku: The term originally used to indicate the three ranks of komusubi, sekiwake and ozeki. Today, the term is usually used in reference to the komusubi and sekiwake only. Sechie-zumo: Sumo performed at the ancient Japanese imperial court as both a religious function and a form of entertainment. Sekiwake: The third highest position on the banzuke or official listing of rank. Shikiri: The toeing-the-mark ritual that precedes the start of every bout in sumo. Shikona: Ring or stage name of the rikishi. Shukun-sho: The Outstanding Performance Award. This prize is given to a rikishi in the top division ranked below ozeki who defeats the most yokozuna or ozeki over the course of a given "basho" or tournament. T Tachimochi: The yokozuna's sword bearer during his dohyo-iri or ring entering ceremony. Tate-gyoji: The highest ranked gyoji or referees in ozumo. They will hold one of two names; Shikimori Inosuke or Kimura Shonosuke. Toshiyori: A term used to refer to the retired rikishi who remain in ozumo as managerial employees of the Nihon Sumo Kyokai. They are more commonly refered to as "oyakata" and their most important function is the training and education of rikishi. Tsuyuharai: Serves as the "usher" of the yokozuna during his dohyo-iri or ring entering ceremony. Y Yokozuna: The highest position on the banzuke or official listing of rank, the yokozuna are often referred to as the living symbols of sumo. Yumitori-shiki: The bow twirling ceremony performed at the end of every tournament day.